The Battle of Golymin took place on 26 December 1806 during the Napoleonic Wars at Gołymin, Poland, between around 17,000 Russian soldiers with 28 guns under Prince Golitsyn and 38,000 French soldiers under Marshal Murat. The Russian forces disengaged successfully from the superior French forces. The battle took place on the same day as the Battle of Pułtusk. 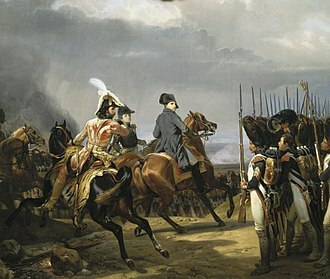 After conquering Prussia in the autumn of 1806, Napoleon entered Poland to confront the Russian army, which had been preparing to support the Prussians until their sudden defeat. Crossing the river Vistula, the French advance corps took Warsaw on 28 November 1806. The Russian army was under the overall command of Field Marshal Mikhail Kamensky, but he was old and becoming infirm. The Russian First Army of some 55,000 to 68,000 men, commanded by Count Bennigsen, had fallen back from the Vistula to the line of the River Wkra, in order to unite with the Second Army, about 37,000 strong, under Buxhowden, which was approaching from Russia and was still some 15 days march from the First Army. However, realising his mistake in allowing the French to cross the Vistula, Kamensky advanced at the beginning of December to try to regain the line of the river. French forces crossed the Narew River at Modlin on 10 December, and the Prussian Corps commanded by Lestocq failed to retake Thorn. This led Bennigsen on 11 December to issue orders to fall back and hold the line of the River Wkra. 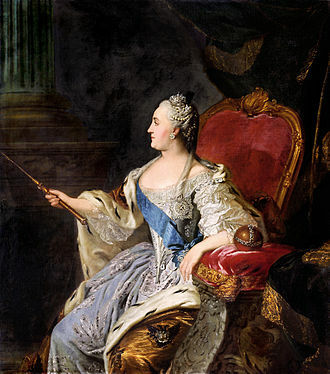 When this was reported to Napoleon, he assumed the Russians were in full retreat. 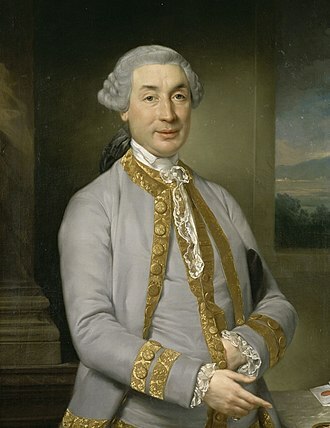 He ordered the forces under Murat (the 3rd corps of Davout, 7th of Augereau and 5th under Lannes and the 1st Cavalry Reserve Corps) to pursue towards Pułtusk while Ney, Bernadotte and Bessières (6th, 1st and 2nd Cavalry Reserve Corps respectively) turned the Russian right and Soult's (4th Corps) linked the two wings of the army. Kamensky had reversed the Russian retreat, and ordered an advance to support the troops on the River Ukra. Because of this, the French experienced difficulty crossing the river and it was not until Davout forced a crossing near the junction of the Wkra and the Narew on 22 December that the French were able to advance. 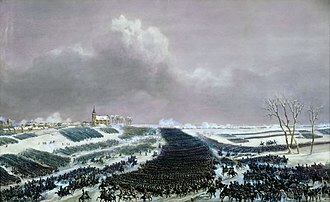 On 23 December, after an engagement at Soldau with Bernadotte's 1st Corps, the Prussian corps under Lestocq was driven north towards Königsberg. Realising the danger, Kamensky ordered a retreat on Ostrolenka. Bennigsen decided to disobey and stand and fight on 26 December at Pułtusk. To the north-west, most of the 4th Division commanded by General Golitsyn and the 5th Division under General Dokhturov were falling back towards Ostrolenka via the town of Golymin. The 3rd Division under General Sacken, who had been the link with the Prussians, was also trying to retire via Golymin, but had been driven further north by the French to Ciechanów. Some of the 4th Division's units were at Pułtusk. The weather caused severe difficulties for both sides. Mild autumn weather had lasted longer than usual. Normally, frosts made the inadequate roads passable after the muddy conditions of autumn but on 17 December there was a thaw, followed by a two-day thaw beginning on 26 December. The result was that both sides found it very difficult to manoeuvre. In particular the French (as they were advancing) had great difficulty bringing up their artillery, and so had none available at Golymin. It rained and snowed incessantly. Provisions became very scarce; no more wine, hardly any beer, and what there was exceedingly bad, no bread, and quarters for which we had to fight the pigs and the cows. The village of Golymin lay in a flat area, with slight rises to the north and north-east. Woods and marshes almost surrounded the village. From the village, the road to Pułtusk ran south-east, that to Ciechanów north-west, and that to Makow (the destination for the Russian retirement) to the north-east. A track linked Golymin to the small village of Garnow to the south. The village of Ruskowo lay to the south-west, and that of Kaleczin a short distance to the west. Wadkowo lay further out along the Ciechanów road. On the morning of 26 December, elements of Golitsyn's 4th Division reached Golymin. They were too exhausted to continue to Makow and Golitsyn also needed to wait for units of Sacken's 3rd Division. In the village he found Dokhturov, who had sent most of his 5th Division towards Makow, but remained at Golymin with a dragoon and an infantry regiment. Golitsyn hoped to rest his men before continuing their retreat. Murat's Reserve Cavalry Corps and Augereau's 7th Corps set out towards the town at first light (around 7 am). Lasalle's Cavalry Division were the first to arrive from the south-west at about 10am. Golitsyn reinforced his rearguard of two squadrons of cavalry with three squadrons of cuirassiers, and Lasalle's men were driven back to the woods. But at around 2 p.m. Augereau's Corps appeared from the east. Golitsyn gave up his attempt to retreat, as his men were too exhausted to retire without fighting. He sent one regiment of infantry under the command of Prince Shcherbatov into the woods around Kaleczin and posted the rest of his troops in front of Golymin. He put his cavalry and Dokhturov's troops as his reserves, and positioned the rest of his division in front of Golymin. Augereau's two divisions advanced, that of Haudelet on the left from Ruskow and Desjardins on the right from Wadkow. Desjardin's division at first drove back Shcherbatov, but being reinforced by an infantry battalion and with the support of their guns the Russians drove the French back. Heudelet's division made very little progress. For the rest of the day the forces skirmished as Heudelet's men slowly pushed round the Russian right. About the same time as Augereau's attack started Murat arrived around Garnow with the cavalry divisions of Klein and Milhaud, and Davout's light cavalry. They drove the Russian cavalry into the woods to the south of Golymin, but were then unable to pursue further because the terrain was unsuitable for cavalry. Golitsyn's force was now reinforced by two cavalry regiments from the 7th and 8th divisions, who had pushed past Augereau's cavalry on the Ciechanów road. However, Davout's 1st Division under Morand was beginning to arrive from the south-east. Golitsyn sent three infantry battalions into the woods and marshes to the south of Golymin, and two cavalry regiments to cover the Pułtusk road. At about 3:30pm Morand's first brigade attacked. After a struggle they drove the Russians out. Davout saw that the Russians were trying to retire towards Makow, and sent Morand's second brigade to advance via the Pułtusk road. A unit of dragoons led by General Rapp charged the Russian cavalry on the road, but found that the marshes on either side contained Russian infantry up to their waists in water and safe from the cavalry. The dragoons were driven back and Rapp was wounded. After taking the woods Morand's division did not advance further, concerned that there would be further useless losses. Night had now fallen and the Russians started to withdraw. Dokhturov's men led the way to Makow, then at about 9 p.m. Golitsyn sent off his guns, cavalry and then his infantry. Augereau occupied Golymin early on 27 December. Losses on both sides seem to have been around 800. While the French held the field, Golitsyn achieved his objective of withdrawing and Murat failed to stop him. General Golitsyn's successful delaying action, combined with the failure of Soult's corps to pass round the Russian right flank destroyed Napoleon's chance of getting behind the Russian line of retreat and trapping them against the River Narew. The Russian columns were at this moment passing through the town [Golymin], and knowing that Marshal Lannes was marching to cut off their retreat by capturing Pułtusk, three leagues farther on, they were trying to reach that point before him at any price. Therefore, although our soldiers fired upon them at twenty-five paces, they continued their march without replying, because in order to do so they would have had to halt, and every moment was precious. So every division, every regiment, filed past, without saying a word or slackening its pace for a moment. The streets were filled with dying and wounded, but not a groan was to be heard, for they were forbidden. The Russian 5th and 7th Divisions retired towards the main body of the army at Różan. Bennigsen's forces fell back to Nowogród on the River Narew, uniting on 1 January 1807 with the forces under Buxhowden. On 28 December Napoleon stopped his advance and, having lost contact with the Russian army, decided to go into winter quarters. His troops were exhausted and discontented, and the supply situation was in great disorder. The break in hostilities did not last long. On 8 February 1807 the two armies faced each other at the dreadful Battle of Eylau. This list is derived from the units referred to in Petre's "Napoleon's Campaign in Poland 1806–1807", and by checking the details for the same formations for the order of battles for Jena and Elyau. 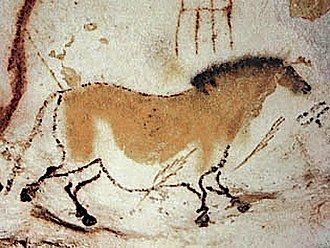 Milhaud's cavalry unit does not appear in either reference. The French list is more detailed as there are more sources to work from. Petre was using the French Army archives for his research, and most unit details appear to be taken from there. The sources referred to give unit compositions down to individual battalions and squadrons. Petre's source for the Russian units present was the memoirs of Sir Robert Wilson, British liaison officer with the Russian army. This was published in 1810 ("Remarks on the Russian Army"). It does not appear to contain any further information to help identify individual units. Stolarski's article appears to make too many assumptions about the Russian order of battle at Eylau to be reliable. Light Cavalry Division under Lasalle – Two Brigades totalling 12 squadrons of Hussars and Chasseurs. Dragoon Cavalry Division under Klein – Three Brigades totalling 19 squadrons of Dragoons. 1st Infantry Division under Morand – Three Brigades totalling 12 battalions of infantry. Note: No guns are mentioned as the French were not able to bring them up due to the muddy conditions. Marbot, Baron M. "The Memoirs of Baron de Marbot". Translated by A J Butler. Kessinger Publishing Co, Massachusetts, 2005. ISBN 1-4179-0855-6 (References are to book and chapter). Also available on line (see external links below). Petre, F. Loraine. Napoleon's Campaign in Poland 1806–1807. First published 1901; reissued Greenhill Books, 2001. ISBN 1-85367-441-9. Petre used many first hand French sources, German histories and documents from the French Army archives. However he spoke no Russian so was not able to use any Russian sources. In the Siege of Hameln or Siege of Hamelin, First French Empire forces captured the fortress of Hamelin from its garrison composed of troops from the Kingdom of Prussia. 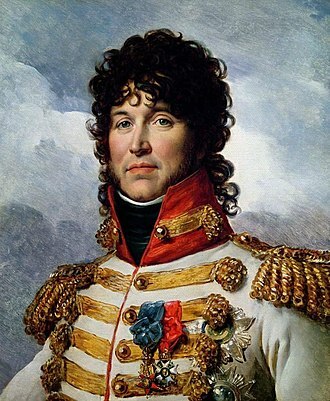 The siege was begun by the VIII Corps under French Marshal Édouard Adolphe Casimir Joseph Mortier, the marshal initially left General of Division Jean-Baptiste Dumonceau in charge of operations. General of Division Anne Jean Marie René Savary soon arrived to conduct negotiations with the Prussian commander General Karl Ludwig von Lecoq, the operation from the War of the Fourth Coalition was a blockade because a formal siege never took place. Hamelin is located 36 kilometers southwest of Hanover, after Emperor Napoleon I smashed the main Prussian armies at the Battle of Jena-Auerstedt on 14 October, his victorious Grande Armée chased his enemies across the Elbe River. This left the Prussian force defending the former Electorate of Hanover strategically isolated west of the river, while Napoleons Grande Armée hunted down Prussian forces between the Elbe and the Oder River, subsidiary forces invaded Hanover and Hesse-Kassel. The defenders withdrew into the fortresses of Hamelin and Nienburg where they were blockaded and captured, in September 1806, when King Frederick William III mobilized the Prussian armies, a substantial force assembled in or near the former Electorate of Hanover. Lieutenant General Gebhard von Blücher concentrated 16 battalions of infantry and 17 squadrons of cavalry to the west at Paderborn, Osnabrück, Leer, in Hanover proper were 20 battalions and 28 squadrons at Celle and Braunschweig. This body became the westernmost field army and its 30,000 troops were placed under the command of General of Infantry Ernst von Rüchel and Blücher. The Prussian high command understood that Napoleons major thrust must come from the south, General-Major Christian Alexander von Hagken and General-Major Karl Friedrich von Brüsewitz were left behind to defend against a French offensive from the Kingdom of Holland and the lower Rhine. Taken together with the garrisons of Hamelin and Nienburg, the entire Prussian strength in the area numbered about 12,000 soldiers, the small mobile forces were assembled near Münster and placed under the command of General Karl Ludwig von Lecoq. Opposing the Prussians were King Louis Bonaparte in Holland and Marshal Édouard Adolphe Casimir Joseph Mortier at Mainz, Louis deployed a 5,000 to 6, 000-man division near Wesel and another similar-sized division at Utrecht, while Wesel itself was well-defended. Napoleon planned to hold Louis and Mortier in place until he defeated the Prussian main army, at time they would seize Hesse-Kassel. On 9 October and Hagken began advancing west in separate columns, the march was slow and on 19 October, the Prussians received news of the catastrophe of Jena-Auerstedt. Lecoq and Hagken immediately fell back on Hamelin, arriving on 23 October, from there, Lecoq set out the next day for the Elbe. Hearing a report that French forces already blocked his path, he halted his march on the 27th and returned to Hamelin where he began acquiring food and supplies to sustain a siege. He sent Oberst Christian Friedrich von der Osten with one regiment and one infantry battalion across the Elbe. 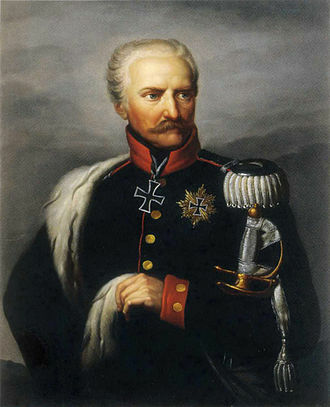 After hearing of Jena-Auerstedt, General-Major Karl Anton Ernst von Bila left Hanover on 20 October with one battalion, the treasure, and he managed to get safely across the Elbe but his small force was caught in the French sweep that followed the Capitulation of Stettin. Late in the battle, the Russians received a timely reinforcement from a Prussian division of von LEstocq. The town is now called Bagrationovsk and is a part of Kaliningrad Oblast, the engagement was fought during the War of the Fourth Coalition, part of the Napoleonic Wars. Of all Napoleonic battles, this is considered to be the most uncertain, Napoleons armies previously smashed the army of the Austrian Empire in the Ulm Campaign and the combined Austrian and Russian armies at the Battle of Austerlitz on 2 December 1805. 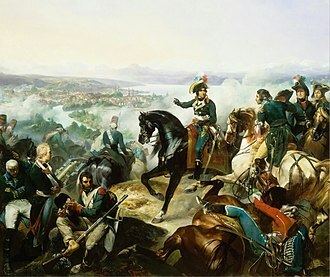 Austerlitz forced the Austrians to sue for peace and their Russian allies to withdraw from the conflict, on 14 October 1806, Napoleon crushed the armies of the Kingdom of Prussia at the Battle of Jena-Auerstedt. Eylau was the first serious check to the Grande Armée and the myth of Napoleons invincibility was badly shaken, the French would end up defeating the Russians in the year at the Battle of Friedland. In late January, Bennigsens Russian army went on the offensive in East Prussia, Napoleon reacted by mounting a counteroffensive to the north, hoping to prevent their retreat to the east. After his cossacks captured a copy of Napoleons orders, Bennigsen rapidly withdrew to the northeast to avoid being cut off, the French pursued for several days and found the Russians drawn up for battle at Eylau. In a vicious evening clash, the French captured the village with heavy losses on both sides, the following day brought even more serious fighting. Early in the battle, an attack by Napoleon failed with catastrophic losses. To retrieve the situation, the emperor launched a cavalry charge against the Russians. This bought enough time for the French right wing to throw its weight into the contest, the Russian left wing was bent back at an acute angle and Bennigsens army was in danger of collapse. A Prussian corps belatedly arrived and saved the day by pushing back the French right wing, as darkness fell, a French corps tardily appeared on the French left flank. That night Bennigsen decided to retreat, leaving Napoleon in possession of a snowy battlefield covered with thousands of corpses, with the Prussian army routed at Jena-Auerstedt, Napoléon occupied the major cities of Germany and marched on east in pursuit of the remaining forces opposed to him. The Prussian soldiers were demoralized by their shattering defeat at the Battle of Jena–Auerstedt on 14 October and unwilling to put up much resistance. The event occurred during the War of the Fourth Coalition, part of the Napoleonic Wars, Erfurt is located on the Gera River about 40 kilometers west of Jena. 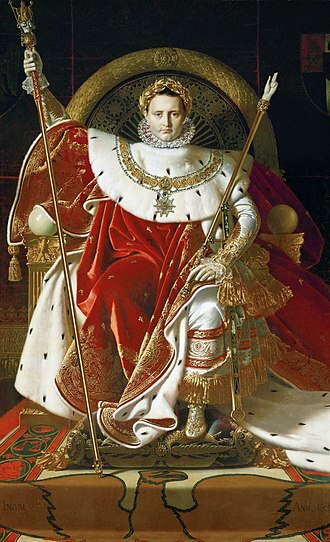 Only eight days before, Emperor Napoleon I of France invaded the Electorate of Saxony with a large army and this was followed by the catastrophe of 14 October. In the aftermath of the battle, the organization of the Prussian army disintegrated, large numbers of Prussian fugitives from the battle entered Erfurt and could not be induced to leave. When Murats French cavalry arrived before the city, it was surrendered without any fighting, in the center, Brunswick concentrated at Erfurt, Hohenlohe defended Rudolstadt in the east, and Rüchel held Gotha and Eisenach in the west. General Karl August, Grand Duke of Saxe-Weimar-Eisenachs division of Rüchels right wing felt south toward the French line of communications, General Eugene Frederick Henry, Duke of Württembergs Reserve lay far to the north at Magdeburg. On 8 October, Napoleons 180,000 troops began crossing the Saxon border through the Franconian Forest and his troops formed in a batallion carré made up of three columns of two army corps each, plus the Cavalry Reserve, Imperial Guard, and some Bavarian allies. On 9 October, the French won the minor Battle of Schleiz, the next day, Marshal Jean Lannes V Corps crushed the division of Prince Louis Ferdinand of Prussia at the Battle of Saalfeld, killing the young prince. 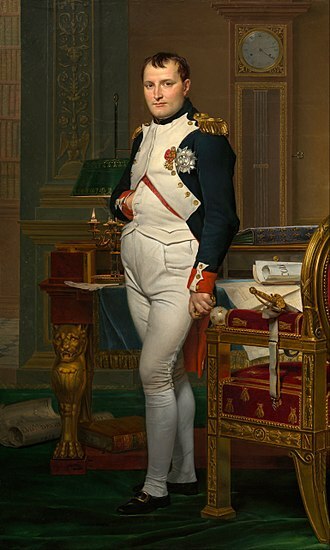 On 12 October, Napoleon ordered his army to make a wheel to the west. The Prussian generals decided to retreat, using the Saale River to protect their flank, Brunswick marched the main army north from Weimar, while Hohenlohe stood on the defensive near Jena as a flank guard. 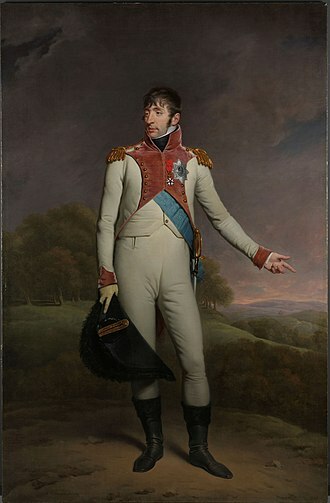 Rüchels orders were to stay at Weimar until Saxe-Weimar returned with his division, the double Battle of Jena-Auerstedt occurred on 14 October as Napoleon attacked Hohenlohe while Brunswick ran into Marshal Louis Davouts III Corps. The troops of Brunswick, and Rüchel were driven in rout from the two battlefields, brunswicks army lost 13,000 men and its commander was mortally wounded. The Prussians were completely demoralized after a two-week-long retreat following their decisive defeat at the Battle of Jena-Auerstedt. Pasewalk is 110 kilometers north of Berlin and about 40 kilometers west of Szczecin, while retreating east toward Stettin on the Oder River, Hagen found his column trapped between Lasalles brigade and Milhauds brigade. Without attempting to out, the baffled Prussian officer surrendered. The incident at Pasewalk came after a similar Prussian surrender after the Battle of Prenzlau the previous day, within a week two fortresses would capitulate without firing a shot and a number of other Prussian columns would be hunted down one by one. On 14 October 1806, the Grande Armée of Emperor Napoleon I of France decisively defeated the Prussians at the Battle of Jena-Auerstadt, at Jena, French losses were 6,794 while Prussian losses were very large but impossible to calculate. 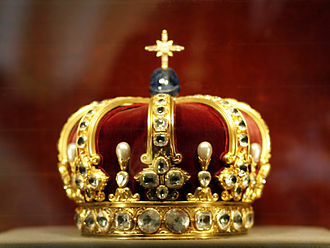 The Saxons saved only 23 of their pieces, while losing 59. The Prussians lost at least 24 guns plus 12 colors, Davout estimated his losses as 7,000 at Auerstedt while his enemies suffered 10,000 killed and wounded and 3,000 captured. The Prussians admitted losing 57 guns from their batteries, not counting regimental guns. 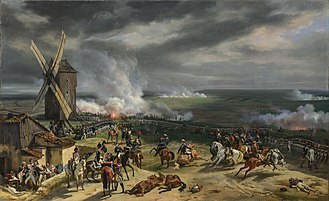 So Davouts claim to have captured 115 pieces may be accurate, the Prussian army was so thoroughly shattered by its defeat that it had not recovered cohesion by the next day. Shot through both eyes, Brunswick expired at Altona on 10 November, the badly wounded Rüchel made his way to Poland where he recovered. The retreating mass of Prussians resolved itself into three columns under Prince Hohenlohe, Lieutenant General Gebhard von Blücher, and General of the Infantry Friedrich Adolf and these forces marched through the Harz Mountains toward Halberstadt. Trailing behind was the 12, 000-man corps of Lieutenant General Karl August, Grand Duke of Saxe-Weimar-Eisenach, on 16 October, French cavalry under Marshal Joachim Murat secured the surrender of 12,000 men and 65 guns in the Capitulation of Erfurt. It was only the first of a series of craven Prussian surrenders, the columns of Hohenlohe and Württemberg rendezvoused at Magdeburg on 20 October. Cavalry charge painted by Jean-Antoine-Siméon Fort. The Grenadiers à Cheval de la Garde Impériale charge at Eylau.